Incredible Adventures strongly believes in the use of shark cages when diving with big sharks and uses protective shark cages on all our great white and tiger shark adventures. 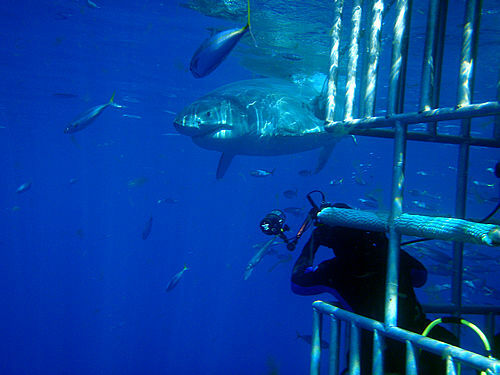 Shark cages help to protect both divers and sharks from harm. Despite what some believe, sharks aren't killing machines out to dine on the first human who swims by. They don't patrol the ocean like "Jaws" just waiting for a chance to eat a surfer or swimmer. But, sharks can and do, very rarely and very accidentally, mistake a human for an elephant seal or big fish. We don't believe in taking unnecessary chances with our customers' lives. 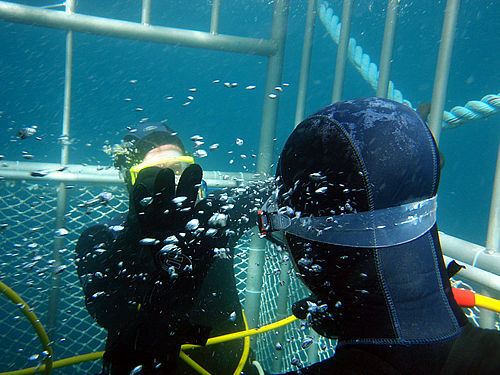 We've hired professionals and spent mega-thousands to design and build the best possible shark cages. The first priority with us is always safety, but equally as important when designing our cages was making sure there were lots of viewing windows for photographers. We want everyone to get lots of great images of sharks. We're personally collecting as many images as possible for educational and research purposes. The more people see sharks, the more they want to work to save them from extinction. Shark cages allow photographers to focus on capturing great images. They reduce the need to always be alert to what is happening beside and behind you. 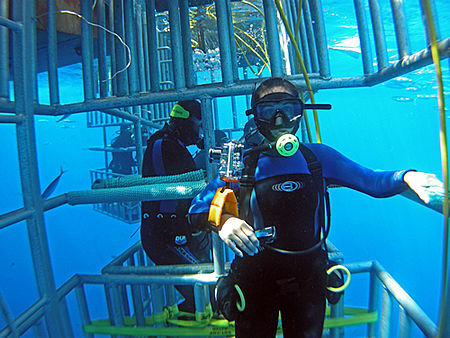 The cages help keep dangerous sharks a safe distance away while allowing you to come eye to eye with some of the ocean's most feared predators. 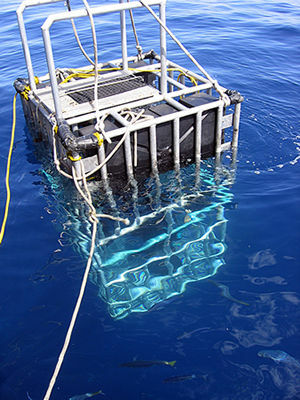 A shark cage allows divers, researchers and film crews to view and photograph the extraordinary world of Great White Sharks, Tiger Sharks and other ocean predators with a certain degree of safety. 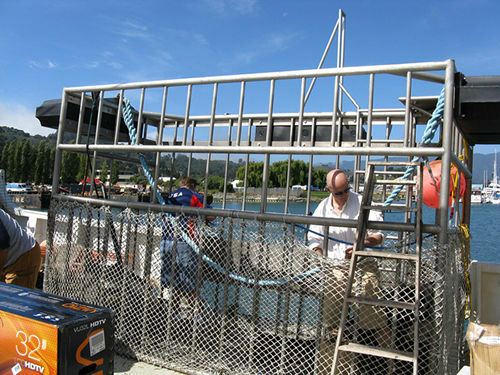 The cages are securely attached to our shark boats with lines. 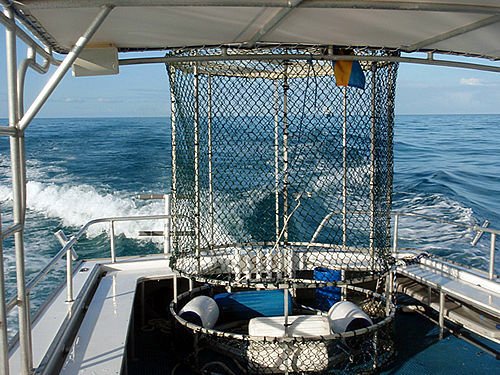 If a cage did manage to break free from the boat, which is extremely, extremely unlikely, the cage would continue to float until it could be retrieved and retied to the boat. No one is allowed into a shark cage unless one of IA's trained staff is nearby keeping watch. Surface cages either have no top (because the top is above the surface) or have large openings for getting in and out. We always have your safety in mind. Losing a customer would be very bad for business! Our shark adventures are wildlife encounters taking place in locations noted for their shark populations. We go to the best places at the best time of year, using the best available boats and equipment but it is important to understand that the sharks are not trained performers, taught to show up and swim by the cage on cue. Sometimes you'll see sharks by the cage. Many times you will not. Please understand that we want you to see sharks just as much as you want to see sharks. Our business relies on having happy customers. We can't however, control the sharks. If you want a guaranteed marine encounter, then you may want to opt for the local aquarium. If you're game for an incredible shark expedition, we'd love to have you join us.